Another great guest post, this time from Tobias Smith, a PhD candidate at the University of Queensland’s School of Biological Sciences. Tobias is investigating bee community shifts across a fragmented tropical landscape in far north Queensland, aiming to identify landscape variation in community composition of two important rainforest pollinator groups, bees and flies. I met Tobias a few years ago as part of the Thiaki rainforest reforestation project for which he is doing baseline surveys of bees and flies. I asked him a while ago to write a ‘primer’ on bees for ConservationBytes.com since so many people really don’t much about the taxon (I include myself in that group). He’s done a brilliant job – everything you wanted to know about bees but were afraid to ask (in 1000 words). The frequently reported, gloomy news about bee declines is hard not to notice. Bees are in dire trouble around the world, and this trend has worrying implications for both ecosystems and human food production. As a result, popular media often reports on the plight of bees, regularly reciting the figure of one in three mouthfuls of food being dependent on the work of bees. While bees certainly are in major trouble, it can be easy to misinterpret statements often made in these kind of articles without a little general bee knowledge. So here are a few bee facts that, at the very least, we ecological representatives should be familiar with. This information should help give some perspective when interpreting bee news, and when engaging in exciting bee conversations at the shops. There are approximately 20,000 bees species globally. Yet when most people think of bees they think of a single species, Apis mellifera, the western honey bee (introduced in most of its range, and also referred to as the European honeybee). This bee is certainly an important bee. It is managed as the usual pollinator of crops requiring biotic pollination, and it makes the honey we usually eat here in the developed world. Some say our domestication of this bee has been an important contributing factor in achieving the level of development that we humans have. There are however, about 19,999 other bee species out there, and most of them are very different to the western honeybee. Bees can basically be put into two groups: social bees and solitary bees (there are some in-betweens, but I will just cover the basics here). Social bees, such as the western honeybee, live in colonies usually of hundreds or thousands, and have a queen (who lays all the eggs), some males, and lots of workers. Social bees usually nest in cavities such as hollow logs, tree hollows, and underground spaces. Social bees make and store honey, or a honey like substance (technically, ‘honey’ only comes from ‘honeybees’, those bees of the Apis genus, of which there are less than 10 species worldwide). Social bees also include bumblebees and stingless bees. Surprising to most however, is that only about 5 % of all bee species are social! The vast majority of bees are solitary species. 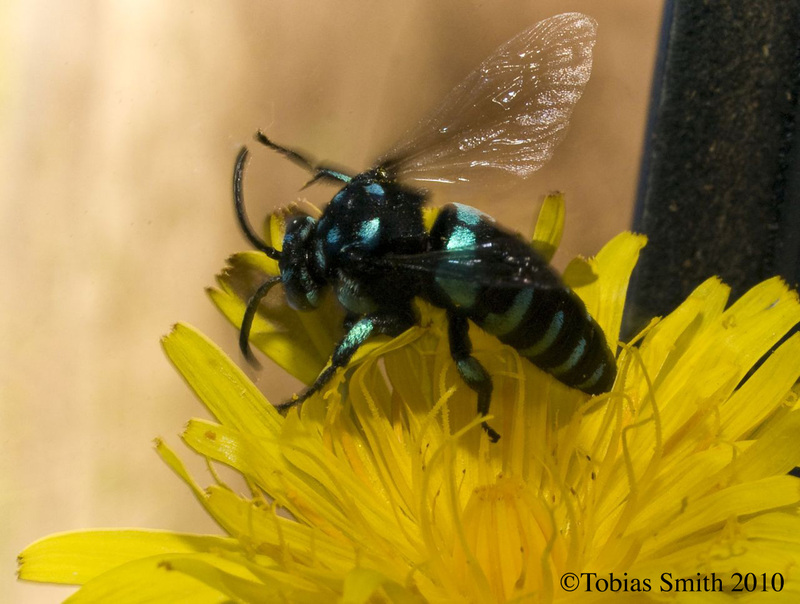 Solitary bees are basically loners. Typically a single female bee finds or creates a suitable nesting location, and deposits (over many foraging trips) a small amount of nectar and pollen in a little pellet. She will then lay a single egg on this pellet, seal it off to create a cell, and start the process again for another pellet, with another egg, in another cell. One nest usually has multiple cells. She will usually only provision 3–10 eggs in her life, and then die. Over time the eggs will develop through the various larval/pupal stages, and eventually when the time comes, fully developed bees will emerge from the nest to start the cycle again. In her life a female solitary bee will usually only interact with other individuals when she mates (usually only once). Males however, will often roost in groups at night after a hard day of feeding only themselves, and maybe doing a bit of mating. Solitary bees have a range of lifestyles. This includes species that create nests in soil, those that nest in holes made in old wood by other insects, carpenter bees that create nest holes in old wood, those that nest in the pithy stems of plants, and even cuckoo bees that lay their eggs in the nests of others (about 15 % of bee species are thought to be parasites). The largest bee in the world is a solitary resin bee, Megachile pluto (39 mm, female) found on an island in north-eastern Indonesia, and the smallest is another solitary species, Quasihesma clypearis (1.8 mm, female) found here in Australia, on Cape York. In Australia we have about 2000 native bee species. Of this, only about 12 species are social. These are the small stingless bees, or sugarbag bees, of mostly tropical and sub-tropical areas of the continent. Of course we also have the introduced social western honeybee (introduced 1822), and in Tasmania the introduced social large earth bumblebee, Bombus terrestris (introduced 1992). The recent arrival (2007) around Cairns of another social bee, Apis cerana (the Asian honeybee) is worrying for both biodiversity and agriculture. Bee declines. The declines reported in the media usually refer to those of Apis mellifera, and usually to declines in managed hives. Apis mellifera currently suffers from a range of diseases and parasites, the most famous being the varroa mite (Varroa destructor). This mite is partially responsible for the huge declines in honeybees throughout much of the world. Varroa ONLY affects Apis mellifera, and Apis cerana. Australia is currently the only continent that is varroa-free. Western honeybees in Europe and North America also suffer from colony collapse disorder, in which bees from a hive suddenly disappear without a trace, leaving behind only the queen. Colony collapse disorder is thought possibly to be a result of a combination of a number of factors including varroa, other diseases/parasites, and pesticides, among others. As well as these highly publicised honeybee declines, there are a number of documented examples of declines of other bee species, primarily those of bumblebee species. Non-honeybee declines are almost certainly more widespread than has been documented, but we simply don’t know enough about bee populations or communities, or have the data, to demonstrate that declines have occurred. We do know that habitat destruction and fragmentation can change bee communities, and have negative effects on species, and that pesticide use can have negative effects on bees. Bees are particularly vulnerable to genetic isolation brought about by habitat fragmentation. So consider yourselves warned, bees are very interesting, they are in big trouble, and there is more to them than queens and honey. While I was writing that last sentence, two species of solitary native bees just flew past my study window. A resin bee and a teddy bear bee. And by the way, no male bee can sting, but females of most Australian native species can (multiple times without dying, unlike honeybees which die when they sting). Thank you for posting this great article. I am hoping to start a hobby in apiculture when I move to Darwin mid-year. I haven’t done much research into it just yet so I’m not sure what is up there, but I will definitely be going for a native species (possibly Meliponini sp.?) to produce a little bit of honey for me, but more importantly to help pollinate surrounding native plants. It’s a win-win situation if you ask me! Loved this post; many, many minutes slipped by last evening following the links and learning more about bees. Thanks for this one. Very nice and easy to understand. It would be an awesome study to learn the identification of so many different species. I certainly will be aware of the Australian native species before I ever visit your country. I hope that is a solitary bee with the many stings and not a social swarm. I don’t know of one like that here. I know from experience we have a very large and aggressive ground bee that will chance you out of the garden and into the house LOL I must learn who she is. Thanks for posting this! !